Home › Places & green spaces › Have you noticed our latest ‘pop-up’ activity in the town centre? Have you noticed our latest ‘pop-up’ activity in the town centre? What’s bright, lime green and comes in a pair at Jacaranda Square? Our new table tennis tables! Yes, the hard-to-miss table tennis tables are the latest addition to our town centre park, complimenting the picnic tables, umbrellas and resort-style seats provided since last spring. 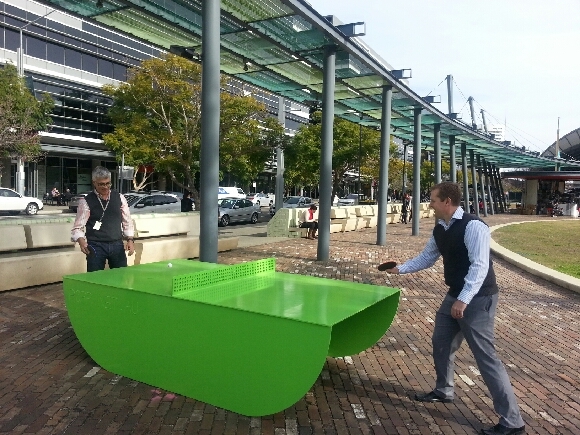 Sydney Olympic Park Authority has now added these outdoor table tennis tables as a further stage of its plans to make Sydney Olympic Park a more ‘liveable’ town centre. We think this new pop-up activity is a really good way for the growing working and residential communities to enjoy an informal and fun break. Just bring a bat and ball and enjoy a social hit, available seven days a week! If you’re a member of the Lifestyle program at the Park you will have a unique opportunity to enjoy a competition at lunchtime this Friday 1 August with ex-Australian Champion Paul Pinkewich!